It’s that time of year again, when Muslims in America call for “days of action” at their state capitols, making statements that law makers and the government itself represents them as a community too! But does it really? Well, it does when it is convenient or gives them free air time, because actually according to their own doctrine, man made laws are laws of ignorance that contradict their religious beliefs. It is not my right to legislate, or your right to legislate, no Supreme Court, no system of government, no democracy where they vote. Can you believe a group of people coming together and voting? And the majority vote will then be the laws of the land! What gives you the right to prohibit something! Who gave you the right! Ramadan, considered to be an Islamic scholar, had his visa revoked in the United States in July of 2004 due in part because his name and address were found on a register of the Al Taqwa Bank which the United States believed to be funding Hamas and other terrorist organizations. In 2006, Ramadan attempted to have his visa reinstated but was denied, this time due to his financial connection again, with a charity known to fund the terrorist group Hamas. In 2010, then Secretary of State Hillary Clinton signed an order that would allow Ramadan to again enter the U.S.
Several Quran verses also show Muslims must only obey Allah’s laws. Many Islamophiles and apologists raved over the first Somali Muslim taking office in Minnesota as she placed her hand on an extraordinarily large, especially made Quran, as she proclaimed our Constitutional oath of office. While there is no rule regarding the use of any particular book to take an oath of office, it is significant one would use a “holy” book (Quran) that instructs its followers to only obey the laws of Allah, not the laws they are swearing to protect. How is it Muslims are subject to only following the laws of Allah and the life of their prophet Muhammad, yet demand man made laws conform to them? 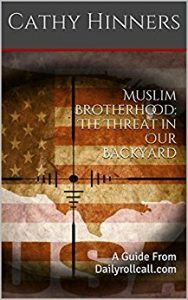 “Muslim Days” held in many state capitols are nothing but deceit and intimidation. They don’t abide by our laws, but cant wait to change them. No, the hallowed halls of our stateliest buildings where the Constitution is adhered to and revered, is made for those that uphold and protect it. Not sharia. ← Previous Previous post: Nashville TN Muslims To Host Imam That Calls Christians and Jews Filthy and Pigs. Next → Next post: A Muslim Organizations Pathetic Attempt To Stifle Free Speech..Again! The thing that is glaring is Hillary let this “SHARMUTA” whore for Islam, back into the country. Thank God Trump won! Now, my belief is that if they profess to want to kill us, take them out. Ship all these cult followers back to the desert. It was the Clintons who brought the Somalia scum in, in the nineties. Deport all these “ack a subs,” these perverted goat humpers back to the dark ages where they came from. Lots of work to do, educate your family your friends of the evil of these vicious bastards.